Urban Earth Design is a landscape architecture firm with over thirty years of professional experience. The firm is committed to preserving, enhancing and expanding the character and quality of the Phoenix Valley, Sonoran Desert Environments, and landscapes throughout the United States. The Urban Earth Design team is comprised of creative, technical, and progressive planners, urban designers, and landscape architects. 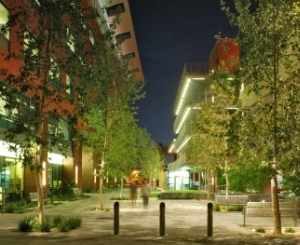 Our work includes campus planning; research facilities; recreation and open space design; community redevelopment and historic preservation; as well as municipal and private space planning and design. We prepare renderings of projects for marketing; graphic design for display boards and environmental graphics; exhibits for zoning cases; construction documents and specifications. Additionally, our firm provides construction administration as well as remediation services. The Urban Earth Design staff also includes landscape and urban planners with strong interests in historic preservation, environmental sensitivity, sustainability, infill development, strengthening regional and neighborhood character, and a deep appreciation of Place-making and Environmental Design. Urban Earth Design focuses on tying aesthetics and function together to form uniquely cohesive designs. This approach has earned the firm both positive media attention and numerous design awards. Urban Earth Design brings creativity, knowledge, and enthusiasm to each design solution. Michael Dollin founded Urban Earth Design in 1989. Michael is an award-winning landscape architect and urban designer whose designs emphasize sensitivity to the environment of cities with a particular focus on cities in the southwest. He has the ability to lead complex projects, especially in the public realm. Michael is also affiliated with Arizona State University in their Joint Urban Design Program, engaging in research and community outreach issues pertaining to the urban environment.